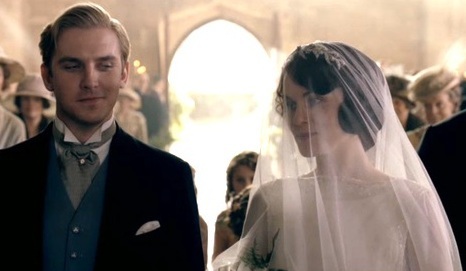 As we mentioned on Tuesday, with the upcoming release of the movie version of The Great Gatsby starring Leonardo DiCaprio and the continued popularity of Downton Abbey the 1920s wedding doesn't seem to be going anywhere. But, although they're the same era, there are actually differences between the two styles. The Great Gatsby is about the "Roaring 20s" and that means fun! Think fireworks, flappers and lots of alcohol. A Great Gatsby wedding would start in the afternoon and carry on to an after party complete with photo booths and food trucks (not that food trucks are from the 1920s, but the idea of always having more food available is very Gatsby). 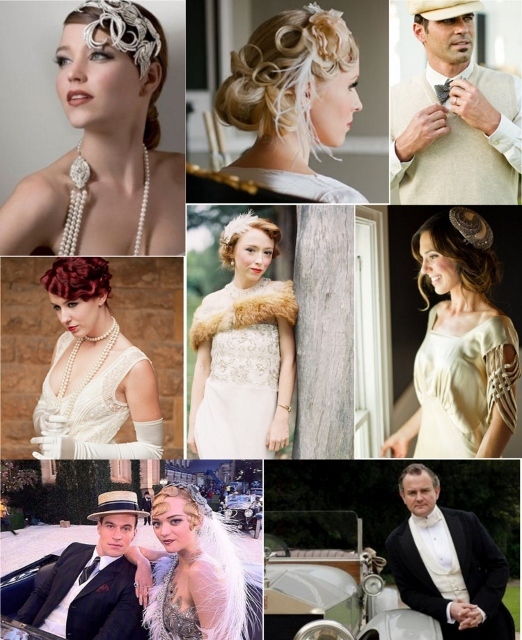 This inspiration board from Burnetts Boards is a perfect example of Great Gatsby style. This fashion board from Belle Memoire sums up the fashions nicely, notice the exposed necklines and dangling jewelry. Lots of glitz and glamour. Downton Abbey takes place at a similar time but it's British themes of class-consciousness give it a more discreet, elegant feeling. A Downton Abbey wedding would take place in the afternoon (as most weddings in the 1920s did) with garden parties and tea sandwiches. There actually is a wedding in the upcoming U.S. season of the show ( UK viewers have already seen the wedding). The picture of the wedding below perfectly shows the more demure, elegant style of the time. 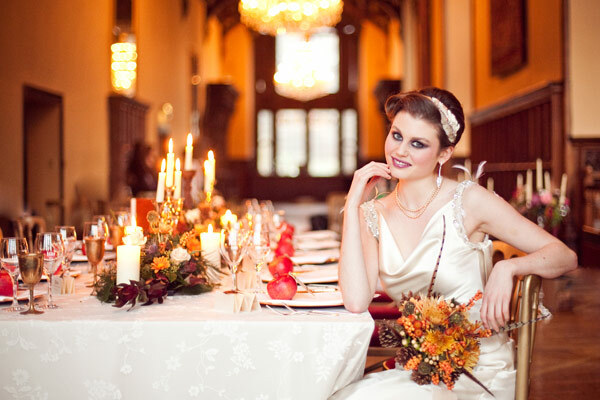 Although the bride's dress in this shot from One Fab Day is more Gatsby than Abbey the tablescape is a perfect example of the show's elegance. 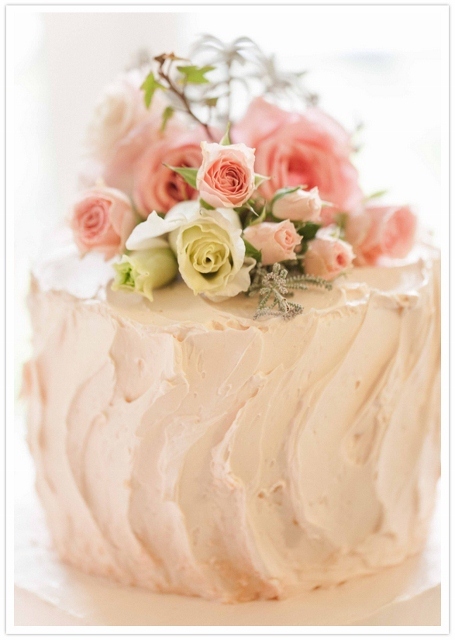 The simple sweetness of this plain pink wedding cake and the car and headpiece from this Downton Abbey photo shoot on 100LayerCake are also great examples of the style. Which style do you like better? 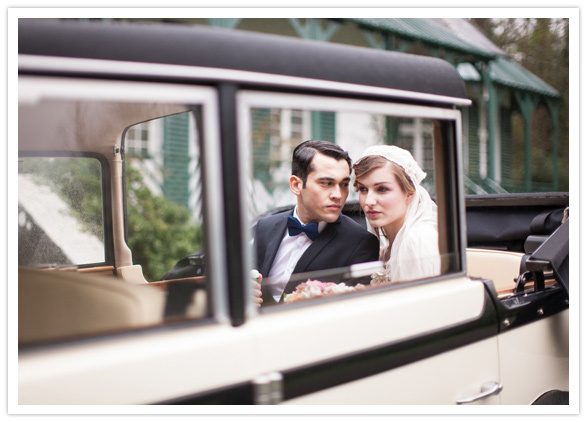 The white hot jazz of a Great Gatsby wedding or the cool sophistication of a Downton Abbey wedding? Will you use either theme in your wedding plans?